You won’t find many Game of Thrones games on your favorite gaming platforms. There was a PC strategy game called “Ascent” developed by Disruptor Beam, but it shut down in Jan 2019. However, there are a few good GoT games for PC, such as “Genesis”, a real-time strategy game and an action RPG simply titled “Game of Thrones”. But are there any GoT games for Android? Combining RTS and RPG game elements, GOT: Conquest reminds me of mobile strategy games like Brutal Age, although there are a few new features that might keep you hooked, at least for some time. The game lets you manage your territory, recruit army, fight rival lords, defend your territory from raids and engage in diplomacy using the game’s unique “allegiance system”. Oh yes, Dragons! You will also raise your dragon and use its infinite powers to destroy your enemies. GoT played in classic Reigns style? Sounds interesting? 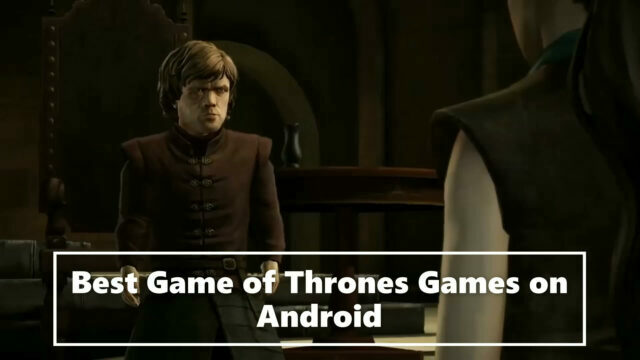 In fact, it’s the best Game of Thrones game you will ever play on your Android device. The game’s unique swipe mechanics will allow you to change the fate of the Seven Kingdoms forever. Reigns: GOT presents a set of cards that can be swiped left or right to make key decisions which will affect your kingdom’s finances, people’s demand and your rivalry with old and new enemies. By just swiping a card, you can meet or reject the plight and demands of your people, advisors, military generals. You will forge new alliances, outwit your rivals and win favor of your people. However, you will have to make ruthless decisions, including eliminating those that you think area threat to your rule by just tearing their cards. Ruling Westeros won’t be easy, and with Reigns, there will be lots of challenges and dangers awaiting you once you claim the Iron Throne. Telltale Games were known for their brilliant episodic interactive adventure games. If you have played a choose your own adventure game, then you will definitely be familiar with the gameplay of a Telltale title. You will have to interact with characters and make certain choices that can change the outcome of the story. There are no puzzles involved and the focus is more on characters and story. GOT - A Telltale Games Series is a point-and-click graphic adventure game. The game follows the Telltale model and each episode lets you make key choices, of which some are extremely difficult to make and can change the course of the story for good. Like other Telltale Games, all episodes of GOT focus more on characters and story, so you will be spending more time conversing with NPCs and interacting with objects, but there are certain quick time events which requires you to take actions quickly, failing which may lead to your character’s death. There are six episodes in this game, and the first episode can be downloaded for free from the Google Play Store.